From decals to tags, IDENT offers customized layout options when you need to safely handle products and other hazardous materials. With access to the new WHMIS 2015 versions, you are supported throughout the transition period and beyond. With a number of inventory kept in stock, we are often able to provide same day delivery. 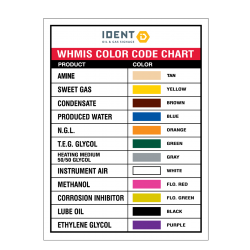 For your individual WHMIS sign needs, contact us to discover what options are available. 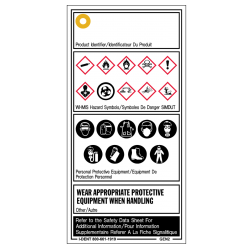 Keep your team aware and safe by marking your products and hazardous materials with decals. Stock offering includes layouts for Produced Water, Sour Produced Water, Methanol, Crude Oil, Condensate, Emulsion, Sour Emulsion, Varsol, Lube Oil, Used Lube Oil and Natural Gas. Special notes: application is best on a flat, clean, and smooth surface and applied above 5°C. 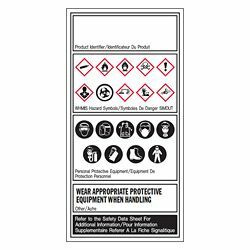 Indicate what products and hazardous materials are present or PPE is needed with a tear & snap resistant tag. Also available in aluminum, as a decal or magnet. Corresponding pipemarking decals and arrow rolls are also available.